From the Flubber Gallery Collection. All photos © TFG, 2011 by Abby Weissman. 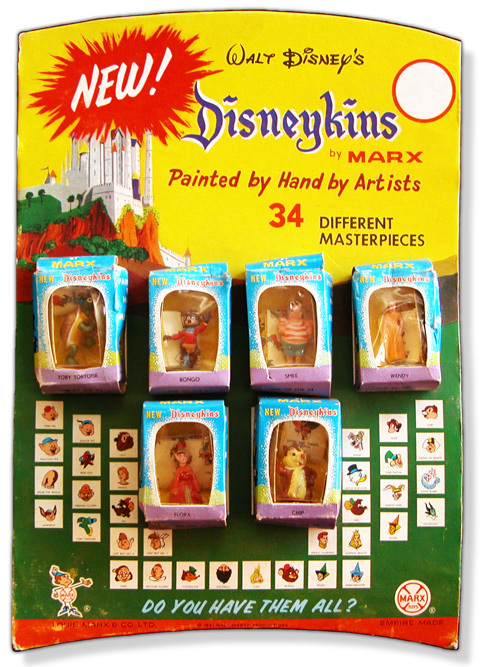 You are viewing a very rare Marx "New" Disneykins easel-back cardboard store display from 1961. What makes there types of displays so uncommon is that they usually were only available to Marx toy dealers. They sometimes arived in wholesale shipments of Individual boxed figures (the type shown on the display) and came directly from the Marx distributors (usually with a gross of 144 figures). The fact that this display has a an empty white circle where the price whould have been (15 cents each) indicates that this display was never used. Sometimes the Marx merchandising Department created store displays only for use at trade shows and in the company showrooms. Besides its distinctive graphics and bright colors, this display is unique in that it features Second Series figures only. They appear in their blue open-faced inidvidual boxes, which comprise one of the two different box formats used for individual boxed "New" Disneykin figures. First Series individual figures were also available in more than one type of box (in three different formats). A majority of the Second Series Disneykins (called "New" Disneykins at the time) were only manufactured for a brief time period (probably 1961-1962) and their scarcity has contributed to the high prices Second Series items fetch in the secondary market. For example, one Maleficent figure, mint in a small green candy box, recently sold on eBay for $215. These prices, especially for the least common and most fragile figures are the norm due to low supply and high demand. And, based upon recent sales on eBay, they have been holding strong. Click on the display above for more about Second Series Disneykins. Auction Watch features select auction results and other notable prices from the recent sales of Disneykins and related plastics. For our listings click here. Question: When will the Flubber Gallery start selling items on eBay? Question: Where do I purchase Marx Disneykins? Question: How do I find out what my figures are worth? Question: My "First Series " Playset has a thick cellophane window on it, while many others I have seen do not and never did. What gives? To find out the answers to these and other frequently asked questions, click on the FAQ header banner or click here. Message from AbbyW: We hope you have enjoyed viewing this free site over the past 11 years and found the information provided both useful and entertaining. Please help support the continuing and future development of Disneykins.com through our ad program and donations links. You can assist us by either giving a donation (through the PayPal "Make a Donation" links on upper right) or by using one of the merchant links on this page. Be a part of the future development of Disneykins.com and other informational sites. For information about TV-Tinykins, go to our new website, CLASSICMARX.com. Thanks! We want to personally thank the supporters of Disneykins.com who have made donations to the site. Thanks for your support!